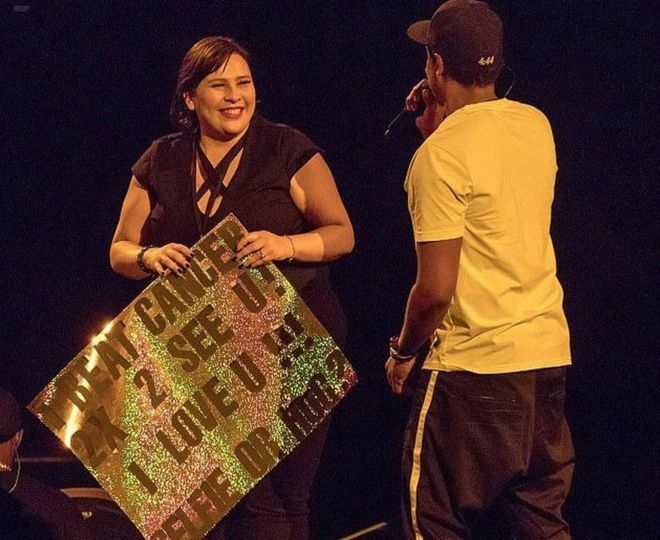 Jay-Z halted his show in California on Saturday to bring a young fan onstage after learning she had beaten cancer not once, but twice. “You beat cancer twice?” the star said. “I gotta give you at least a hug.” He then brought the woman up on stage and posed for several photos with her, as the crowd cheered. Cruz said she’d been overwhelmed by all the “love and support” from fellow fans after the concert, and was “still in shock”. Jay-Z’s California date came near the end of his tour, which has criss-crossed the US since October. It comes in support of his latest album, 4:44, which has been nominated for eight Grammys, including album of the year, record of the year and song of the year, for the title track. Introducing that track in California, the star called it “the most uncomfortable song I’ve ever written”. The lyrics address his infidelity – which also informed his wife Beyoncé’ last album, Lemonade.